This is a short summary of Ancient Egyptian history (before the Roman Empire) by Hourly History focusing on the lifestyle, the structures they left behind and the type of rule in Egypt. The book starts with the Egyptian mythology - the story of Isis, Osiris and Set and eventually, how these led to a lot of their traditions such as mummification and the importance they gave cats in their society. The book also touched upon the importance of the Nile River and also, about the structures that they built. 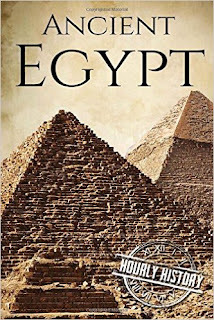 The book picked out some of the most popular aspects of Ancient Egypt, being the mummification, the Great Pyramids of Giza and the Sphinx and the various possible purposes why they might have been built (no, it was not necessarily a tomb, contrary to popular belief). The book also elaborately explained Ancient Egyptian mythology and the reasons as for the traditions of Ancient Egyptians. It also talked about some of the popular pharaohs such as Tutankhamun and even talked about a less known fact of his birth name being different; which he changed to end the legacy of the unpopular previous pharaoh. However, while the book covered the well known facts about Egyptian history, it hardly touched upon the less known facts, such as their conflicts with the Hittites. The book also tried too hard to connect the events in Ancient Egypt to biblical references which I felt was not necessary (for instance, the story of Moses during the reign of Ramesses II was mentioned at least thrice). This book is good for those who wish to know about the some well known facts of the Ancient Egyptian civilisation and yeah, it is not exactly the author's fault that a lot of the mysteries surrounding the civilisation is yet to be discovered. On the whole, I would award the book a six on ten.